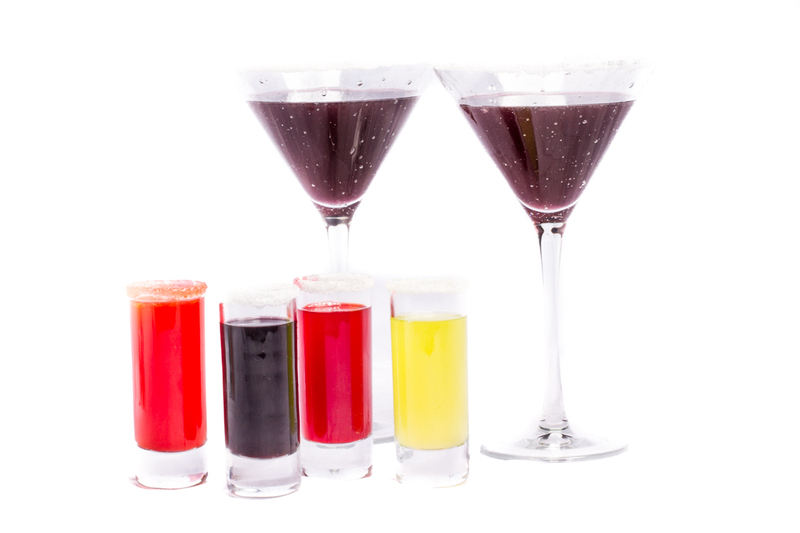 Sour Patch Kid inspired shooters and Mocktini. Sour Patch Virgin Shooters Front from left to right: Sunrise, Sour Grape, Sour Cherry, Sour Lime and at the back: Sour Patch Kid Mocktail. Previously I blogged about the dilemma with syrups when making shooters. Without an additional ingredient like juice, pop, milk or something the drink can be a little like that sugar tolerance test you take at a clinic – sickly sweet and not at all palatable. So I lay in bed wondering what can be done about this, and my science brain starts steaming. Citric acid as a Rimmer! Turns out I am not the only one who figured this out, and that there are many recipes for sour powder out there. According to ehow.com making sour powdered sugar isn’t that hard. All you need is citric acid and powdered sugar. Check out the recipe here. Another gal shows a recipe for sour powder including gelatine, baking soda. Not sure what the baking soda adds to the mix, I would think bitterness though. Here is her video. And what is the best way to use sour powder? Sour patch kid drinks! So I look to see if anyone had the idea, and yep that’s not a new concept. Turns out that there is even a virgin shooter recipe online. TheModernWoman actually came up with a virgin shooter based on that idea – for a girls night with mom’s to be. Check out her blog here for her great take on sour patch shooters. The ingredients are below. She didn’t have exact measurements in her blog, so I have included what I did. Depending on the colour of the shooter, not all the ingredients are used. The first step is to mix 2 packs Unsweetened Koolaid powder with 8 oz water and 4 oz sweet & sour mix for the foundation to the drinks. Fill each drink about 1/2 full. Sweet Sunrise Flavour: add 1/2 oz orange juice & 1 tsp grenadine to fill to 3/4 full. Sour cherry & Sour Grape flavours: simply add 1 tps grenadine and top with sour mix. Sour Lime: Sour lime flavour: only add sweet and sour mix to the drink. Once you get the foundation flavours mixed up (they should be sour tasting and kind of strong) the rest of the drink mixing is done mostly by feel and mixed in the glass. The grenadine adds a lot of sweetness, so depending on how much you like sour, you may choose to add more or less of this. I couldn’t find lime Koolaid locally, so I improvised making a pretty awesome sour lime out of the following: 4 oz sweet and sour mix, 4 oz water, 4 oz rose lime cordial syrups, 1.5 oz bottled lime juice and 3 drops green food colouring. Our family tried these out and my husband knocked all four back (brave man!) Us gals shared a set of four flavours sipping at each. These are very much like their name sake – and the sour hits you after the second sip – but they are equally full of flavour. Because of the strength and sourness of these they have that “Shooter” feel and I am looking forwards to offering these as my latest Skeeters (virgin shooters) for the next event I am invited to. Kid-o-metre 5/5 My kids loved these! Taste: 4.5/5 So much like the sour kid candy ! Simplicity: 5/5 Once I worked out the amount of water and sour mix for each of the flavours this was fun and easy to make. Ingredient finding: 4/5 Required adapting the lime recipe, otherwise easy to find ingredients. The basics of a sour mix is lemons, limes and sugar. According to seriouseats.com making the mix to have on hand for cocktails is a must and buying the mix isn’t necessary. Well I am all for that! Here is their take on it. Make a simple syrup using sugar and water. Cool and add strained juices. Keep in fridge. This is the very simplest of recipes that I introduced above, from ehow.com slightly adjusted to make a more crystallized and sour rimmer. Mix ingredients in a sealable container and store until needed. Other ideas for sour patch drinks? There were no virgin drinks online, but Drinkmixer.com had a sour patch cocktail – that wouldn’t be hard to alter and turn it into a Mocktail. Here is the resulting drink recipe adapted and tested. Mix the first four ingredients and the juice from the lime into a cocktail shaker with ice. Pour into cocktail glass filled with ice – rim with sour powder to add an additional sour hit! When I first made this drink using the original recipes quantities, but in syrups instead of liqueurs, it was overpoweringly sweet. Due to the sweetness of the sweet and sour mix I chose to use (the sugar syrup based recipe), and the sweetness of the grenadine and curaçao syrup, the Mocktail version of this drink had a high concentration of sugar. I went back to the original recipe and tried again using their sour mix suggestion – which was simply lemon juice and a bit of sugar mixed together. I also increased the lime from one wedge in the original recipe to a half ounce to help balance the taste. And finally, because the original cut the sweetness with vodka and I had chosen club soda, I doubled the amount of club soda to balance the drink further. The resulting colour of the mix is a fantastic purple, and the taste is fruity with a strong lime tone. The drink definitely has potential – and if you like fizz I would recommend adding even more club soda to your mix. Kid-o-metre 5/5 Kids loved this. Taste: 4/5 The adaption worked – kids say it could even use more club soda . Simplicity: 5/5 Simple and easy to make. Ingredient finding: 2/5 Requires home made curaçao, sweet and sour mix and a trip out of town for grenadine. I found a more simple recipe that may be more sour than sweet on DrinkMixer.com which called for 8oz lemon juice and 2 Tbsp sugar only. This may produce a more sour mix – if you need to balance out sweetness of syrups.